Making a discovery in astronomy is always exciting. However, while some discoveries have an immediate and obvious scientific impact, other discoveries require a period of incubation to tease out their wide-ranging implications. The discovery and study of Apep, a new colliding-wind binary system that has confounded our ideas of how massive stars lose their mass near the end of their lives, fits well into the latter group. The path that led to the discovery of Apep started with a relatively simple crossmatch between X-ray and radio surveys in the last year of my undergraduate study at the University of Sydney, under the supervision of Bryan Gaensler and Sean Farrell. Immediately we knew it was an interesting source, with exceptionally bright emission at X-ray, radio, and infrared wavelengths for a source unknown in the literature. What followed was a flurry of ideas about what the source could be based on the archival information at hand, such as a young stellar object, an abnormal cataclysmic variable, or an odd colliding wind-binary. However, none of our ideas about the nature of the source seemed to perfectly hang together. 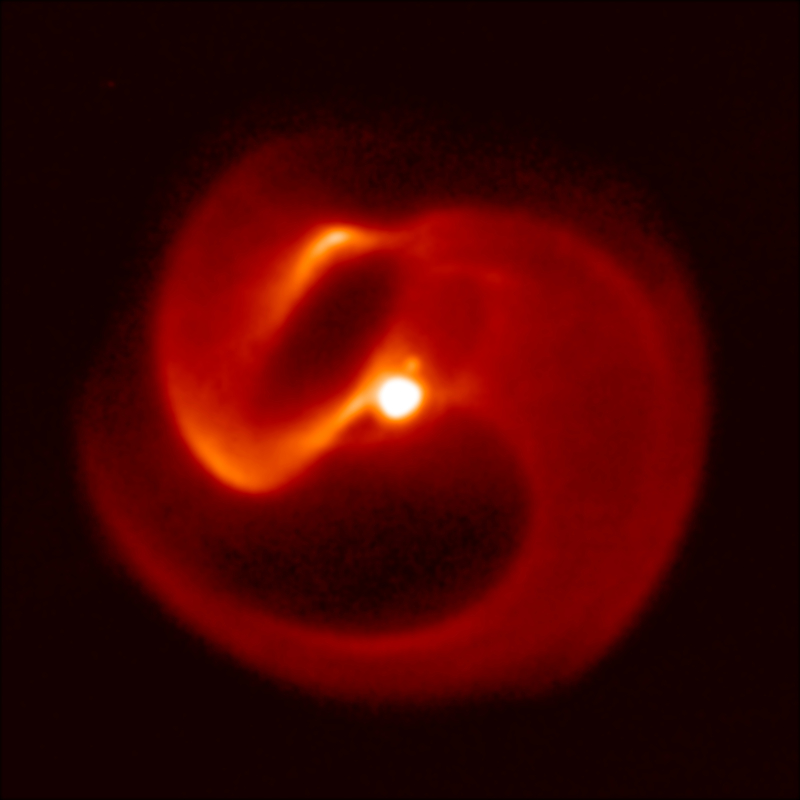 Momentum was behind the idea that Apep was a new colliding-wind binary but the radio emission would make it the brightest radio colliding-wind binary discovered outside of the unique object Eta Carinae, not to mention the observed radio variability was strange for such a characterisation. We reasoned we could write up a short-paper detailing the archival data and our best guess of the nature of the source. However, I thought there was something special here - such a paper would just pass the discovery onto someone else. Unfortunately, timing was not our side as I had to start my PhD with Bryan Gaensler (University of Toronto) and Ron Ekers (CSIRO) in the completely different field of radio galaxy evolution. Therefore, the work on Apep naturally ended up on the backburner. This is where the imaging guru Peter Tuthill (University of Sydney) comes into the story as the extreme infrared properties of Apep particularly caught his attention. He understood that to make progress with unveiling the nature of Apep, we needed a high-resolution infrared image to reveal the dust morphology. This would particularly help in discerning whether Apep was a young stellar object or a colliding-wind binary. We wrote a proposal to use a mid-infrared camera on the European Southern Observatory’s Very Large Telescope (VLT) to image the source in the middle of my PhD (which I kept on the down-low with my PhD supervisors). Unfortunately, we got unlucky for quite some time with bad weather or broken instruments. We finally got the time in the last year of my PhD but, because of the rush that always happens at the end of a doctoral thesis, we did not prioritise reducing the data right away. It was only as I was writing up the conclusion chapter of my thesis we became aware that the data was about to become public and we had better reduce it quickly just in case something interesting popped out that made the story of Apep compelling. And the old adage “pictures speak louder than words” definitely applies to the the spectacular image you can see below (Figure 1 in the paper). When that image appeared on our screens, it was clear that this is likely one of the most captivating images an astronomer could hope to produce in their career. The image, as perfected by Mark Edwards (University of Sydney), also immediately confirmed to us that we were dealing with a colliding-wind binary. Mid-infrared image of Apep displaying the speculator sinuous dust spiral being sculptured by the massive binary located at the centre. While the image is beautiful, we were stuck with what it meant scientifically. It immediately brought to mind the so-called “Pinwheel Nebulae” that Peter had discovered 20 years ago, but this was larger and with more complicated structure than the clean Archimedean spiral observed in those systems. Since pinwheel plumes encode many fundamental stellar parameters, and because proper motion studies of the dust structure give geometrical distances and wind properties, we obtained Director's Discretionary Time on the VLT for a second epoch of infrared imaging and spectra. At this point I had started my post doctoral fellowship at the Netherlands Institute for Radio Astronomy (ASTRON), so I was sitting in a radio astronomy institute trying to get my head around how to reduce infrared spectra and images. Thankfully, hot-star expert Peredur Williams (University of Edinburgh) was available to help us interpret the spectra of the system, and I was lucky enough to run into Paul Crowther (University of Sheffield) at a conference who also cast his expert eye over the spectra and system. They identified the likely presence of two massive stars at the end of their lives in the system, which seems to help explain the incredible radio and X-ray brightness. However, the second epoch infrared image we got back was unexpected and produced the most pressing enigma for the system. The dust pattern had hardly moved at all. It appeared to be almost stagnant. This was totally unexpected because, thanks to the spectrum taken by Lucyna Kedziora-Chudczer (UNSW), we had evidence of gas in the system moving at over 3400 km/s. At any reasonable assumption of the distance to the system, the dust pattern was moving far too slow. According to all our physical models, the dust should be moving at the speed of the gas. Finding the dust behaving in such a way presented a fundamental problem: it was like finding a feather in hurricane hardly moving at all. This contradiction made us critically question all our assumptions about the system. In particular, perhaps the system lay at a much greater distance than we thought? However, in order to reconcile the two speeds, the system needed to be more than halfway across the galaxy. This idea immediately seemed to throw up more problems than it solved. The extreme luminosities from the radio to X-ray, when scaled for this hypothetical distance, placed the object’s energetics orders of magnitude beyond any known stellar physics. In addition to this, many lines of evidence from the data, such as kinematic distances derived from diffuse interstellar lines found in the spectra, all supported our original estimate of the distance. We now had all the pieces of the jigsaw and Peter and Ben Pope (New York University), with whom I had discussed the nature of Apep with extensively since the discovery, led the way in putting all the bits of the puzzle together. The fundamental problem with the physics at the heart of the system was how to explain the discrepancy between the gas and dust speed, and that became the focus of the research. We felt emboldened that genuinely new astrophysics was required to explain Apep by a recent 2017 paper by Ryan Lau (Caltech) and his colleagues, who found that the dust plume around another pinwheel system were also misbehaving in a similar fashion. The dust plume in that system seemed entirely stagnant. One possible solution to this puzzle, noted in Ryan's paper, is that maybe the dust is a kind of fossil relic from an earlier evolutionary phase. The dust is just drifting along in its own bubble with the pace determined from a slower past, but will be soon swept up by the new fast wind evident at the heart of the system. While such a “switch-in-state” scenario can naturally explain stagnant dust, Peter showed that Apep’s plume, which is slow but still moving, cannot fit with this picture. Having ruled out two different wind speeds sequential in time, it fell to an insight from Ben to suggest the two winds might co-exist, but instead occupy different regions of space. This immediately opened a new avenue to explore: anisotropic mass loss can produce winds with heterogeneous properties. The physical picture emerging to try to make sense of Apep begins with critical rotation of one of the stars in the system. This enables the star to launch a fast polar wind (explaining the spectroscopic wind speed) and a slow equatorial wind (the kinematics inherited by the dust). However, if this is truly the mechanism for formation of the plume, the implications were more far-reaching than the physics of winds and dust outflows. Rapid rotation of a massive star near the end of its life has significant implications for the most energetic explosions in the Universe, long-duration gamma-ray bursts. Although the chain of logical steps between the data and the conclusions was long, it seemed that the Apep system had given us a probe into a domain formerly not observable: the rotation state of massive stars. The publication of the paper from that point on was also a journey, since the paper had to achieve quite a diverse set of goals in a small amount of space. First, we had to detail the discovery of Apep and the physical characteristics we derived. Then we had to explain the wind discrepancy problem and the potential solution to that via critical rotation, and the wide reaching implications of such a solution. That is a long story to fit into a short Nature Astronomy paper, and as such you can see the supplementary material accompanying the main text is a paper in its own right. I owe it to Peter for being able to pull all those various strands into one cohesive story, and providing sagacious leadership in the refereeing process. This is just the beginning of the story of Apep and what it can tell us about gamma-ray bursts and the way massive stars end their lives. We hope it will become a touchstone object like WR 140, and given its truly exceptional properties, perhaps even a system to rival Eta Carinae in importance. I have no doubt others who take up the challenge of explaining this system will arrive at new insights, or show us how some of the other pieces of the jigsaw pieces can be made to fit. In particular, several problems still remain: how can the X-ray emission stay relatively static over decades but the radio emission show significant variation? What is the exact composition of the inner binary? How can the radio emission be so bright? Are there nested shells of colder dust further out than what we see in the mid-infrared, as predicted by our model? Instruments like ALMA and the James Webb Space Telescope (JWST), and more detailed theoretical modelling, will be key in solving some of these problems. The story of the discovery of Apep demonstrates just how fun, but also how convoluted, an exciting discovery in astronomy can be. You can find the paper here. 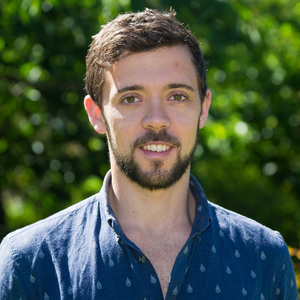 The author thanks Peter Tuthill and Ben Pope for contributions to this post.